OBJECTIVES: The objective of this study is to examine efficacy of text message reminders and to educate and promote safe personal listening device (PLD) use in young adults. METHODS: Three hundred and eighty-seven urban college students from an urban university located in New York City, New York, participated in this pre- and postsurvey 6-month study (September 2016–March 2017). One hundred and ninety-eight students assigned to Group 1 (safe PLD use) received biweekly informative and humorous text reminders to encourage safe PLD use; 189 students assigned to Group 2 (controls) received monthly text messages related to the importance of their participation in the study with no mention of responsible PLD use. The Kruskal–Wallis test was used to analyze the pre- and postquestionnaire data; outcomes were considered significant at P < 0.05. RESULTS: Participants who received text message reminders reported significant (H = 86.7, P < 0.001) change in increasing responsible PLD use; no significant change was reported by controls (H = 0.002, P = 0.96). Females assigned to Group 1 reported modified PLD use more (H = 6.7, P < 0.01) than males, suggesting a gender effect. Participants who received the bi-weekly text reminders rated them as helpful in promoting responsible PLD use; participants assigned to the control group who did not receive biweekly text reminders indicated the reminders could have been helpful in promoting safe PLD use. CONCLUSIONS: Text message reminders were reported and appear effective in motivating responsible PLD use in young adults. Rosenhall (2003) found that while noise-induced hearing loss acquired before older age lessens the effects of aging at 3000–6000 Hz, deterioration at adjacent frequencies was faster. Recently, Aarhus et al. examined HFHL acquired in childhood and the comorbidity of aging and/or noise exposure in adulthood. They found that the combined effects of HFHL acquired in childhood and noise exposure was a simple additive effect; however, the addition of aging demonstrated a “superadditive” effect. They posited that the damaged inner ear hair cells made them more susceptible to age-related degeneration. The increase of HFHL from excessive noise exposure is a public health concern as impaired hearing is associated with poorer quality of life and includes difficulties with communication, reduced social interactions, isolation, a sense of exclusion, and depression as well as economic burdens. More recently, Lin et al. found an association between hearing loss, cognitive impairment, and dementia in older adults. Motivating older adolescents and young adults to use their PLD more responsibly is challenging. Hearing education campaigns that provide information and demonstrate healthy hearing practices have been found to be ineffective in modifying adolescents' music listening behavior. Rawool and Colligon-Wayne found that the use of hearing protection in adolescents and young adults was associated more with their beliefs than knowledge and the pleasant and/or gratifying sensation that loud music/media produced. Blesser and Salter suggested that the physicality of loudness is a positive experience of intense energy that generates emotions and arousal, which may suppress the recognition of a negative consequence such as potential hearing loss. Further, hearing conservation among youth has a low priority relative to other health issues such as alcohol, drug use, and smoking, which have more immediate detrimental health consequences. Public media campaigns targeted to the harmful effects of smoking, drugs, and alcohol, using graphic and consequential outcomes in advertisements, have been effective in promoting healthy practices.,, Punch et al. suggested that hearing health messages and strategies on responsible PLD use employ age-appropriate media and multimodality interventions. Further, educational information on safe PLD listening use in adolescents and young adults investigating the effectiveness of various media was determined warranted. Serpanos et al. found that evocative imagery had potential as an effective approach in hearing protective health campaigns for motivating safer PLD listening practices in young adults. Specifically, college-age young adults found that the image of an individual listening to music/media wearing earphones next to an image of an individual wearing a behind-the-ear-type hearing with the message “hear today, gone tomorrow” (“listening to music/media under earphones at high volume [> ½ setting] for a prolonged time can permanently damage inner ear structures, which can lead to permanent hearing loss that you may not notice initially”) was more motivating than the text alone or an image of inner ear hair cell damage accompanied by the text. Short message serve (SMS) or text messaging is becoming a popular technology to increase medication adherence, clinical management, and modify or change behavior. Between January 2009 and October 2012, the Health Resources and Services Administration (2014) conducted a meta-analysis that examined the effectiveness and acceptance of health text messaging interventions in the United States and other high-resource countries. Seven systematic reviews and a synthesis of evidence from the Agency for Healthcare Research and Quality Health Care Innovations Exchange were included in the study. The report concluded that text messaging could improve health knowledge, behaviors, and clinical outcomes, due to their wide population reach and their ability to be individually tailored. Text messaging can deliver interventions to the individual with ease, without thought on their part, and has been shown to be useful for sending reminders, advice, instruction, and other educational content and for maintaining users' awareness of their health goals. Armstrong et al. found that participants who received a daily text reminder to use sunscreen had a daily compliance rate of 56.1%; in contrast, a control group who did not receive the daily text reminder had a mean daily compliance rate of 30%. They concluded that text messaging was effective in improving sunscreen adherence and at low cost. In a smoking cessation study, Free et al. found that participants who received text messages that motivated, encouraged behavior change, and were somewhat tailored to concerns maintained abstinence (verified by self-report and biochemically at 6 months) compared to controls that received text messages unrelated to quitting. They concluded that text messaging significantly improved smoking cessation rates and is an effective tool to consider. As text messaging is familiar to and used by most adolescents and young adults, they may be somewhat open to receiving a health reminder regarding hearing conservation. The American Academy of Pediatrics (2015) recommended reduction in barriers to telemedicine as well as increased research and funding to expand access to health care. The purpose of this study was to examine if text messaging would serve as an effective reminder to educate and promote young adults to use their PLDs responsibly. The institutional review boards of the two universities involved approved this study as exempt; approval codes are IRB #16–93 and #081616, respectively. Three hundred and eighty-seven college students enrolled at an urban university located in New York City, New York, in the United States participated in this study; participation was strictly voluntary. Participants were recruited from a required 1st-year freshman seminar as access to them could occur for the 6-month study duration and thus easily followed. One of the investigators met with potential participants during their freshman seminar to explain the purpose of the study and its importance. A participation form was distributed and completed by students interested and willing to participate in the 6-month study. Regardless of willingness to participate, all students received a written informational message [Appendix A] on safe PLD use. Importantly, participants were accepted into the study whether or not they intended to modify their PLD use. By including participants regardless of their intent, a broader population of college-age PLD users would be reached and potentially increase awareness of the importance of responsible PLD use and/or hearing health. Participants indicating their willingness to participate were randomly assigned to one of two groups: Group 1 received a biweekly text reminder on safe PLD use and Group 2 (controls) received a monthly text as a reminder of their participation in the study. All participants assigned to both the experimental and control groups were informed of recommended levels of safe PLD use (Appendix A); specifically, to use their PLD under earphones or headphones, preferably noise-cancelling, 1-h or less per day at 60% maximum volume. It is acknowledged that the specific relationship between amount and duration of exposure and hearing loss has yet to be determined; however, sufficient data exist to confirm that PLD use and other social activities in noisy environments are potentially hazardous to hearing. Thus, some guidance to participants was determined warranted. One hundred and ninety-eight students assigned to Group 1 (safe PLD use) received a biweekly text reminder that varied between humor, rhyme, and information to encourage safe PLD use [Appendix B]. One hundred and eighty-nine students assigned to Group 2 (controls) received monthly text messages related to the importance of their participation in the study but with no mention of responsible PLD use [Appendix C]. Frequency of text messages to promote health has varied between daily (e.g., promoting smoking cessation and sunscreen use) and less frequent (e.g., biweekly for promotion of sexual health). 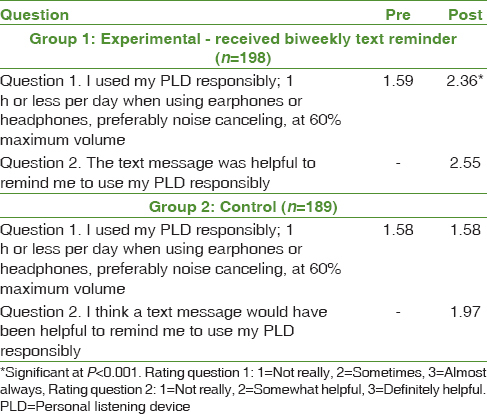 A biweekly text was determined to be sufficient to communicate the need for responsible PLD use (Group 1) and a monthly text to controls (Group 2) to limit message overload, potential annoyance, and ignoring of too frequent reminders. A brief questionnaire was also administered to all participants before the study and after 6 months at the completion of the study, regarding their PLD use and the effectiveness of text message reminders to use PLDs responsibly. 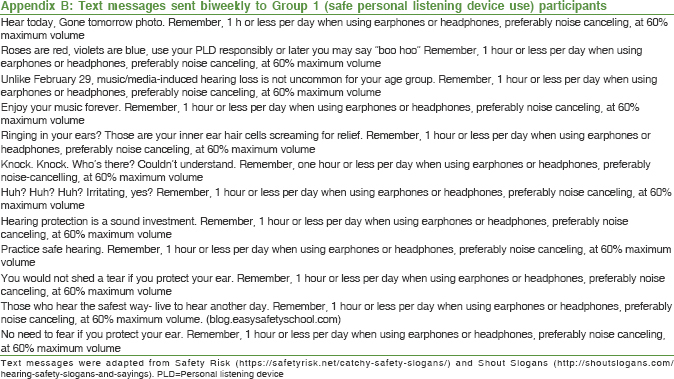 A pre- and poststudy question was asked on responsible PLD use (I used my PLD responsibly; 1 h or less per day when using earphones or headphones, preferably noise cancelling, at 60% maximum volume), rated on a 3-point scale (1 = not really, 2 = sometimes, and 3 = almost always). The prestudy questionnaire also included an item on gender. A second poststudy survey question was asked on the effectiveness of text messaging reminders (Group 1: the text message was helpful to remind me to use my PLD responsibly and Group 2: I think a text message would have been helpful to remind me to use my PLD responsibly), rated on a 3-point scale (1 = not really, 2 = somewhat helpful, and 3 = definitely helpful). The Kruskal–Wallis test was used to analyze the pre- and postquestionnaire data. Outcomes were considered significant at P < 0.05. Two hundred and eighty-six (73.9%) of the 387 participants completed the pre- and postsurvey questions; 140 (70.7%; 60 males, 80 females) of the 198 participants assigned to Group 1 (received biweekly text message reminders) and 146 (77.2%; 62 males, 84 females) of the 189 participants assigned to Group 2 (controls). Prestudy, similar mean ratings were obtained for both groups (Group 1 = 1.59 and Group 2 = 1.58) [Table 1], indicating participants “not really” to “sometimes” used PLDs responsibly. No significant difference (H = 0.135, P = 0.71) in PLD use was noted between groups. At 6-month poststudy completion, mean ratings for experimental group participants (Group 1) improved to 2.36 (“sometimes” to “almost always” used PLDs responsibly) but no change (1.58) for controls [Group 2 and [Table 1]. The Kruskal–Wallis test revealed that participants who received text messaging reminders reported significant (H = 86.7, P < 0.001) change in increasing responsible PLD use; no significant change was reported in controls (H = 0.002, P = 0.96). Females receiving biweekly text message reminders reported modified PLD use significantly more (H = 6.7, P < 0.01) than males, suggesting a gender effect for responsible PLD use. Poststudy, all participants were asked to rate the effectiveness of text messaging reminders. An average 2.55 rating was given by experimental group participants, indicating the text messaging reminders as “somewhat helpful” to “definitely helpful” [Table 1]. The mean rating (1.97) for the control group participants suggested that they believed text messaging reminders would have been “somewhat helpful” to remind them to use PLDs responsibly. This study examined the use of text messaging to increase responsible PLD use in young adults. Similar to previous studies using text messaging to improve health outcomes by changing behavior,,, results from this study indicated that participants who received biweekly reminders reported they were using their devices more responsibly and that the text messages were helpful. Participants who received the biweekly reminders reported a significant improvement (P < 0.001) in responsible PLD listening behavior, at least in the short term. Outcomes from this study also revealed that on average, participants who received the bi-weekly text messaging reminders rated them helpful in promoting responsible PLD use, while those participants assigned to the control group and did not receive the bi-weekly text message reminders on responsible PLD use indicated that the reminders could have been helpful. Thus, it appears that text messaging increases awareness, intent, and motivation to change risky listening behaviors. A gender effect for responsible PLD use was found, indicating that females receiving biweekly text message reminders reported modifying their PLD use significantly more (P < 0.01) than males. Gender effects in PLD use have been found in previous studies, where female adolescents and young adults reported lower PLD listening volumes, and shorter listening durations than did males. In contrast, a recent study found no gender differences on motivation to modify PLD listening use behaviors in young adults when examining different types of hearing health risk education information sets (text with or without visual images). The use of text messaging to improve health promotion, disease prevention, and management appears encouraging. In a review of four studies that targeted preventive health behaviors, Fjeldsoe et al. found that SMS-delivered intervention improved short-term behavioral change outcomes. Repetitive and annoying texts are less likely to be paid attention to or discontinued, and thus, care must be taken in the structure and frequency of reminders. As reminders can potentially serve to spark individuals to think about important health behaviors that they might not otherwise intentionally think about and they have to be framed such that individuals want to receive it. The reminders cannot be perceived as repetitive or annoying, which will make them be less likely to pay attention to and/or continue to receive the messages. Gold et al. designed a study to determine the characteristics of text messages that promoted behavior change regarding sexual health in young adults. One hundred and forty-one young adults, aged 16–24 years, agreed to participate in focus groups and receive a text message every 2 weeks. Results indicated that this technology was engaging to participants and more likely to be remembered and shared when messages were funny, rhymed, tied to a particular event, and balanced between information and humor. Informal language, message style, variety, and schedule of text messages were found to be important factors in acceptability. The results of this study support previous studies and suggest that text messaging reminders can potentially initiate individuals to think about important health behaviors, such as responsible PLD use. When used in concert with media campaigns and text messages that incorporate clever imagery and messages, a significant positive impact on changing behavior may follow.,,, Clarifying the factors that lead individuals to maintain these actions successfully is needed. A limitation inherent in self-report surveys is the potential for social desirability response bias, where participants acquiesce and provide a socially desirable response. In conclusion, similar to other studies,,,,,,, examining health-related behavioral change outcomes, the use of text messaging appears to be effective and appropriate for educating and promoting responsible PLD use in young adults. Hearing loss in your age range is increasing and has been associated with repeated and prolonged listening to intense levels of music and/or other media using personal listening devices (PLDs) such as smartphones and iPods/MP3 players. In NYC, 25% of young adults, aged 18–44 years, report some degree of hearing loss or ringing in the ears due to iPod or MP3 player use. This study, approved by the Pace University Institutional Review Board, is examining if text reminders, sent to you on your smartphone, will promote and help you use and maintain PLD safely. If you agree to participate in this 6-month study (from September 2016 to April 2017), you will be randomly assigned to one of two groups. If you are assigned to Group 1, you will receive a text message every other week to remind you to use your PLD responsibly. If you are assigned to Group 2, you will receive a text message once per month to remind you that you are participating in this study. At the end of 6 months, I will ask you to complete 2 questions that will take less than 3 minutes to complete. Your information will be held in the strictest confidence; no one but me will have access to your personal information. Your participation may motivate you to change your PLD listening behavior by the completion of the study. Furthermore, you will help me to determine if text messaging is an effective tool to promote more responsible PLD use in this population, which may have an impact on public health policy. While I would appreciate your participation, you can choose not to participate or withdraw at any time. It is recommended that you use your PLD 1 h or less per day when using earphones or headphones, preferably noise canceling, at 60% maximum volume. New York City Department of Health and Mental Hygiene (DOHMH). Health Department Launches ad Campaign Warning of the Dangers of Listening to Loud Headphones; 2013. Available from: https://www.metro.us/local/new-york-city-health-department-ad-campaign-targets-loud-headphones/tmWmlc---aaurZI4ZuW18c. [Last accessed on 2018 Aug 17]. Vogel I, Verschuure H, van der Ploeg CP, Brug J, Raat H. Adolescents and MP3 players: Too many risks, too few precautions. Pediatrics 2009;123:e953-8. Albera R, Lacilla M, Piumetto E, Canale A. Noise-induced hearing loss evolution: Influence of age and exposure to noise. Eur Arch Otorhinolaryngol 2010;267:665-71. Aarhus L, Tambs K, Nafstad P, Bjørgan E, Engdahl B. Childhood sensorineural hearing loss: Effects of combined exposure with aging or noise exposure later in life. Eur Arch Otorhinolaryngol 2016;273:1099-105. Wallhagen MI, Pettengill E. Hearing impairment: Significant but underassessed in primary care settings. J Gerontol Nurs 2008;34:36-42. Lin FR, Yaffe K, Xia J, Xue QL, Harris TB, Purchase-Helzner E. Hearing loss and cognitive decline in older adults. JAMA Intern Med 2013;173:293-9. Rawool VW, Colligon-Wayne LA. Auditory lifestyles and beliefs related to hearing loss among college students in the USA. Noise Health 2008;10:1-10. Blesser B, Salter LR. The Unexamined Rewards for Excessive Loudness. In Communications: 9th International Congress on Noise as a Public Health Program; 2008. Available from: http://www.icben.org/2008/pdfs/blesser_salter.pdf. [Last accessed on 2018 Apr 07]. Chung JH, Des Roches CM, Meunier J, Eavey RD. Evaluation of noise-induced hearing loss in young people using a web-based survey technique. Pediatrics 2005;115:861-7. Elder RW, Shults RA, Sleet DA, Nichols JL, Thompson RS, Rajab W. Effectiveness of mass media campaigns for reducing drinking and driving and alcohol-involved crashes: A systematic review. Am J Prev Med 2004;27:57-65. McAfee T, Davis KC, Alexander RL Jr., Pechacek TF, Bunnell R. Effect of the first federally funded US antismoking national media campaign. Lancet 2013;382:2003-11. Palmgreen P, Lorch EP, Stephenson MT, Hoyle RH, Donohew L. Effects of the office of national drug control policy's marijuana initiative campaign on high-sensation-seeking adolescents. Am J Public Health 2007;97:1644-9. Punch JL, Elfenbein JL, James RR. Targeting hearing health messages for users of personal listening devices. Am J Audiol 2011;20:69-82. Serpanos YC, Berg AL, Renne B. Influence of hearing risk information on the motivation and modification of personal listening device use. Am J Audiol 2016;25:332-43. Wei J, Hollin I, Kachnowski S. A review of the use of mobile phone text messaging in clinical and healthy behaviour interventions. J Telemed Telecare 2011;17:41-8. Health Resources and Services Administration (HRSA). Using Health Text Messages to Improve Consumer Health Knowledge, Behaviors, and Outcomes: an Environmental Scan; 2014. Available from: https://www.mathematica-mpr.com/our-publications-and-findings/publications/using-health-text-messges-to-improve-consumer-health-knowledge-behaviors-and-outcomes. [Last accessed on 2018 Aug 17]. Armstrong AW, Watson AJ, Makredes M, Frangos JE, Kimball AB, Kvedar JC. Text-message reminders to improve sunscreen use: A randomized, controlled trial using electronic monitoring. Arch Dermatol 2009;145:1230-6. Wangberg SC, Arsand E, Andersson N. Diabetes education via mobile text messaging. J Telemed Telecare 2006;12 Suppl 1:55-6. Franklin VL, Waller A, Pagliari C, Greene SA. A randomized controlled trial of sweet talk, a text-messaging system to support young people with diabetes. Diabet Med 2006;23:1332-8. Free C, Knight R, Robertson S, Whittaker R, Edwards P, Zhou W, et al. Smoking cessation support delivered via mobile phone text messaging (txt2stop): A single-blind, randomised trial. Lancet 2011;378:49-55. Klass P. Using Phones to Connect Children to Health Care. New York Times; 18 January, 2016. Available from: https://well.blogs.nytimes.com/2016/01/18/using-phones-to-connect-children-to-health-care/?ref=health&_r=0. [Last accessed on 2018 Aug 17]. Smith A. Americans and Text Messaging. Pew Research Center; 19 September, 2011. Available from: http://www.pewinternet.org/2011/09/19/americans-and-text-messaging/. [Last accessed on 2018 Aug 17]. Committee on Pediatric Workforce, Marcin JP, Rimsza ME, Moskowitz WB. The use of telemedicine to address access and physician workforce shortages. Pediatrics 2015;136:202-9. Williams GC, Niemiec CP, Patrick H, Ryan RM, Deci EL. The importance of supporting autonomy and perceived competence in facilitating long-term tobacco abstinence. Ann Behav Med 2009;37:315-24. World Health Organization. Make Listening Safe; 2015. Available from: http://www.who.int/pbd/deafness/activities/MLS_Brochure_English_lowres_for_web.pdf?ua=1. [Last accessed on 2018 Aug 17]. Gold J, Lim MS, Hellard ME, Hocking JS, Keogh L. What's in a message? Delivering sexual health promotion to young people in Australia via text messaging. BMC Public Health 2010;10:792. Vogel I, Brug J, Hosli EJ, van der Ploeg CP, Raat H. MP3 players and hearing loss: Adolescents' perceptions of loud music and hearing conservation. J Pediatr 2008;152:400-4. Williams W. Noise exposure levels from personal stereo use. Int J Audiol 2005;44:231-6. Torre P. Young adults' use and output level settings of personal music systems. Ear Hear 2008;29:791-9. Fjeldsoe BS, Marshall AL, Miller YD. Behavior change interventions delivered by mobile telephone short-message service. Am J Prev Med 2009;36:165-73. Wakefield MA, Loken B, Hornik RC. Use of mass media campaigns to change health behaviour. Lancet 2010;376:1261-71. Adams AS, Soumerai SB, Lomas J, Ross-Degnan D. Evidence of self-report bias in assessing adherence to guidelines. Int J Qual Health Care 1999;11:187-92.